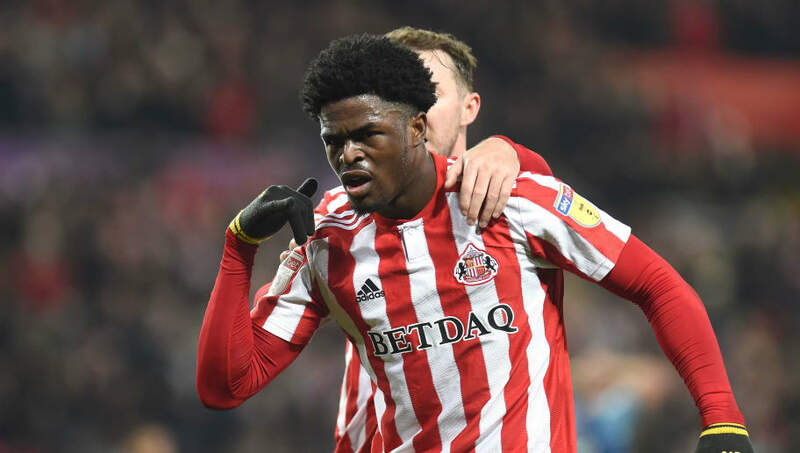 ​West Ham have been keeping an eye on 20-year-old Sunderland striker Josh Maja, with a view to signing the youngster before loaning him back out. Maja is contracted to Sunderland until the end of the season, but has turned down a new contract offer at the Stadium of Light amid interest from several suitors. Crystal Palace and Cardiff from the Premier League have both been linked, as well as Scottish giants Celtic and Rangers. The Hammers have now emerged as a new interested party and could sweeten their offer by loaning Maja back to Sunderland. According to the ​Sunderland Echo, West Ham are prepared to loan the striker back to the Black Cats for 18 months after completing a deal this window. It is understood that West Ham have spoken with the players agent and a fee of around £3m could be enough to acquire his services. London-born Maja has become a vital part of the side's League One promotion push, scoring 16 goals so far this season. Sunderland manager Jack Ross revealed that selling Maja with a loan-back option was 'potential solution' for the club amid uncertainty over the player's future. He said: "It's a potential option, a potential solution if you like. If he did go, then naturally we have to find a replacement at a time when we're also looking to strengthen in that area. "I've had a similar situation with Lewis Morgan who signed for Celtic in January and was loaned back to St Mirren. It was a perfect scenario for me at that juncture. So it's something, because of Josh's age and how any purchasing could would view him, that it could be a potential option for us."